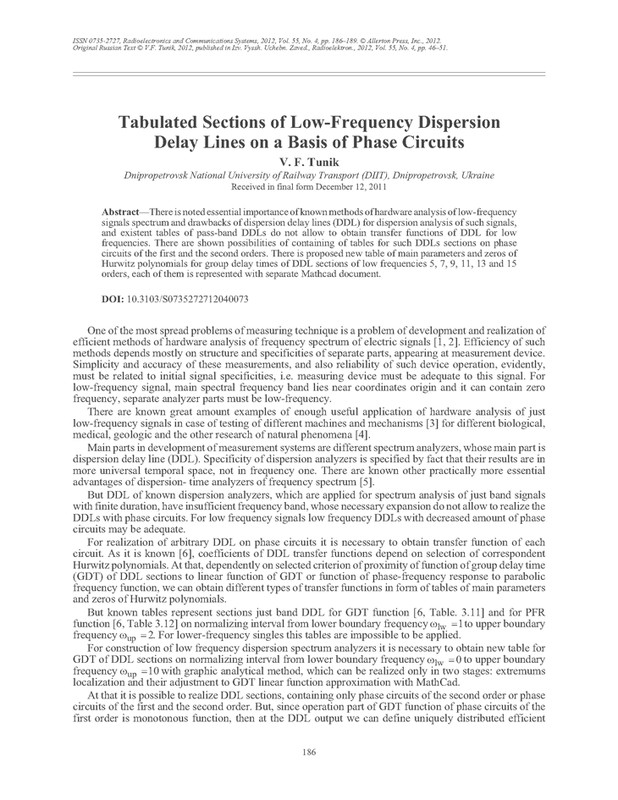 There is noted essential importance of known methods of hardware analysis of low-frequency signals spectrum and drawbacks of dispersion delay lines (DDL) for dispersion analysis of such signals, and existent tables of pass-band DDLs do not allow to obtain transfer functions of DDL for low frequencies. There are shown possibilities of containing of tables for such DDLs sections on phase circuits of the first and the second orders. There is proposed new table of main parameters and zeros of Hurwitz polynomials for group delay times of DDL sections of low frequencies 5, 7, 9, 11, 13 and 15 orders, each of them is represented with separate Mathcad document. V. G. Kriksunov, Spectral Analysis of Electrical Signals (Tekhnika, Kyiv, 1971) [in Ukrainian]. C. Rauscher, V. Janssen, and R. Minihold, Fundamentals of Spectral Analysis (Rohde&Schwarz, Munich, 2004). S. B. Stopskiy, Spectrum Analyzers for Sound and Infrasonic Frequencies for Acoustic Spectroscopy (Gosenergoizdat, Moscow–Leningrad, 1962) [in Russian]. B. G. Kaduk, Krukovskiy-Synevych, and V. V. Sadovskiy, Spectral Analysis with Time Scale Compression (Tekhnika, Kyiv, 1968) [in Ukrainian]. V. I. Tverskoy, Dispersion-Time Methods of Measuring of Radiosignals Spectrum (Sov. Radio, Moscow, 1974) [in Russian]. V. L. Avramenko, Yu. P. Galyachev, and A. A. Lanne, Electrical Delay Lines and Phase Inverters, Handbook (Svyaz’, Moscow, 1972) [in Russian, ed. by A. F. Beletskii].